A wonderful gymnast up till her retirement, Simona Amanar has been a great asset to the Romanian gymnastics team, earning innumerable medals for herself and bringing glory to her country. A powerful tumbler and a consistent performer, Amanar leaves a beautiful page in gymnastics history. An impressive vaulter and a dedicated gymnast, Amanar handles the press with gracious restraint, and is often praised for being good-natured and well behaved. Over her gymnastics career, which spans nearly a decade, Amanar has won many vault titles in international competitions. Although she never won any major all-around title (excluding the Olympic title), she has quietly and consistently gained her place as one of the top gymnasts in the world. ghent Often overshadowed by her team mates, Amanar never truly attain the due recognition she rightly deserves. However, she has been a constant force since making her major international debut in 1994. Being rather shy, she has always been more comfortable letting her team mates bask in the glory. Amanar first emerged into the gymnastics scene when she competed for Romania in a match against Great Britain and placed third overall. 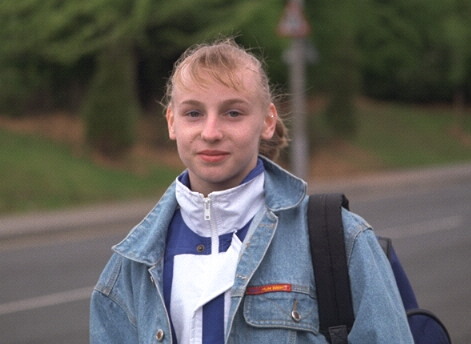 She also contributed to the team gold in both the European championships and the World championships the same year, at 15 years old, only her second year of competing with the Romanian National team. At the 1996 Atlanta Olympics, Amanar was the most successful Romanian gymnastics Olympian, winning the bronze for team competition, bronze for the all-around, gold for the vault event final and silver for the floor exercise event final. With her success at the Olympic games, Amanar was named best Romanian athlete 1996. this award has been previously won by gymnasts such as Nadia Comaneci, Lavinia Milosovici and Gina Gogean. After the retirement of team mates Lavinia MIlosovici and Gina Gogean, Amanar led the Romanian team to gold in the 1998 European championships and the 1999 World championships in Tianjin. Amanar guided the Romanian team to a gold medal in the 2000 Olympics and earned individual glory for herself by garnering the individual All-Around title (with the second highest score). she retired at the end of the year, not without winning the World Sports Award in the athletics category first. With all her achievements, Amanar provides an excellent inspiration to many young gymnasts who habor great dreams.